One in every eight couples struggles to conceive or maintain a pregnancy. In Charlotte, at least 4,000 people seek infertility treatment every year. As such, the city has become a hub of knowledge and resources for patients diagnosed with infertility. A local chapter of the national infertility support group RESOLVE, embryo banks, follicle preservation and alternative health care are treatment options patients can locate in the Charlotte area. 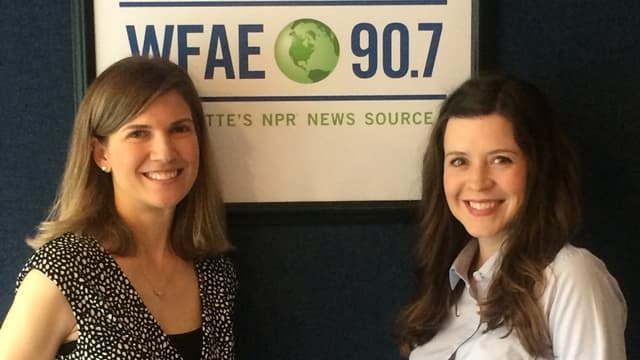 With the prevalence of infertility cases, how caregivers and patients communicate around this medical condition takes on greater importance, which is why two UNC Charlotte researchers are investigating ways to improve discourse on the subject. Bethany Johnson, a UNC Charlotte research faculty associate in the Department of Communication Studies and a research affiliate for the University’s Women + Girls Research Alliance, along with Margaret Quinlan, associate professor of communication studies and a core faculty member of the Interdisciplinary Health Psychology Ph.D. program at UNC Charlotte, are currently conducting academic research related to patient-practitioner communication in fertility clinics. “Our interest is in helping practices to make patients feel seen, heard and understood while maintaining a healthy work-life balance for doctors and nurses,” Johnson explained. Johnson and Quinlan’s work explores the various issues facing individuals across the gender spectrum diagnosed with infertility, as well as some of the cutting-edge treatments now available. Although infertility is generally understood from a biological perspective, research shows that individuals with infertility face undesired emotional and social outcomes from treatment, such as stress (depression, anger and frustration), uncertainty, marital instability, anxiety-related sexual dysfunction, financial hardship and fear of social censure or a lack of social and emotional support. In addition to issues that individuals face, couples also can experience tension in their relationship that could compound other emotional and social outcomes like, sexual dysfunction, low self-esteem and fear of isolation. “Families, friends and members of the medical community don’t know necessarily what to say or how to support someone going through infertility treatment. Some things, although well intended can be hurtful. We hope to inform people of supportive and unsupportive messages” Quinlan said. In their study, Johnson and Quinlan explore the issues that accompany infertility and explain them, in part, as a result of the “taboo” associated with the condition and stress the need for conversation. The general sense of shame associated with infertility stems from pronatalist discourse in society, which is a practice that encourages women to become mothers as their “biological destiny.” This in turn causes a stigma, ending a conversation before it begins. The two researchers used historical medical records, personal accounts and media coverage to examine attitudes about infertility among individuals and within the medical community and the public at large. This historical perspective allowed Johnson and Quinlan to address areas where progress has stalled. “Our interviewees were looking for people to listen, to not give advice or have solutions but to be there,” Quinlan said. As qualitative researchers, Johnson and Quinlan examine communication issues and create resources for patients and practitioners to make sense of infertility in formal and informal contexts. Their research revealed a discrepancy in desired patient support and the support patients received during treatment. Communication surrounding infertility can be difficult given that most patient care happens outside of the office. “A lot of the infertility treatments are done at home instead of a traditional office setting. Not having someone to contact or ask questions is difficult for patients. It’s a different kind of regimen that doesn’t fit into the hours of nine to five,” Quinlan said. The study references interviews from 26 women, most of whom related their experience to that of “cattle on a conveyor belt” being pushed through the infertility process. Research gathered by the professors indicates the disconnect caregivers display when communicating with patients, in some cases, can be improved by simply rephrasing the message or using the patients name during communication. Johnson and Quinlan also suggest making resources like a contact for emergency texts or a list of previously approved instructional YouTube videos for at home treatments, readily available for patients. “Infertility treatment is expensive, and insurance doesn’t always cover it. It can cost anywhere from $800 dollars to $30,000 dollars for each cycle. In North Carolina, there is no mandate of coverage for infertility care. If you’re paying out of pocket, you may have higher expectations from your health care,” Johnson said. The work conducted by the professors extends the current research in communication studies and provide preliminary data needed to understand the communication processes between patients and reproductive, endocrinology and infertility (REI) medical practitioners. The ultimate goal is to provide guidance to health care practitioners and patients with infertility as they interact in REI offices and treatment settings. Scholars who have previously studied infertility focus on the emotional and social consequences of treatment. Johnson and Quinlan surveyed the challenges arising from communication between patients and practitioners at REI practices during the treatment itself. “Our work will fill a particular gap in the available literature. This study serves as the first entry into the patient-practitioner discourse, starting with the examination of females' stories, shedding light on issues of female patient agency during infertility treatment,” said the researchers.